Un-veiled is an audio-visual installation consisting of two “films” , Smoke and Fog, and auto-ethnogaphical data. The two “films” were originally envisaged as experimental documentaries come audio-visual poems made from original photographic documentation. Each soundtrack presents a digitally transmuted vocal response to these images, referencing the equally smokey jazz clubs of the time by fragmenting a popular jazz standard of the period. 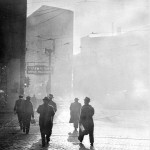 As a poetical documentary, both Smoke and Fog hover on the cusp between past and present, setting up a conversation between different technologies, between virtual experience and the imagination of another time and place that yet has a marked relevance to increasing, if now less visible urban air pollution. 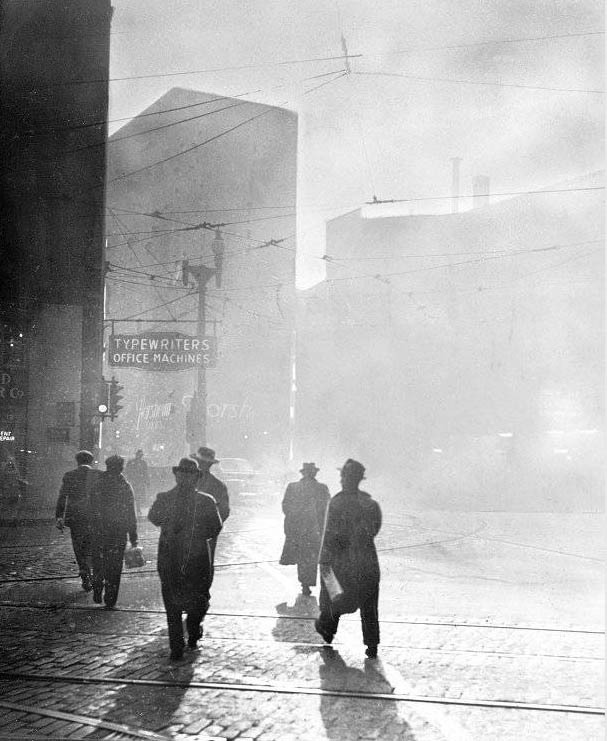 Whilst Smoke uses back & white photographs of mid 20th-century air pollution in the cities of Pittsburgh and St Louis (courtesy of the Smoke Control Lantern Slide Collection, University of Pittsburgh), Fog uses images of the infamous London pea-soupers (sponsored by Getty Images). The project is accompanied by a data collection of notes on Annalist, which will accompany the films for the installation as an auto-ethnographical experiment of process. The material will also form the basis of a semi-structured data model expanding on my Model of Procedural Blending which “aims to expand sound art discourse by considering process in sound art practice through an exploration of artists’ experiences”. Procedural Blending model has some marked similarities with work on provenance to describe processes in scientific research, but also some marked differences. The series is part of a JISC-funded (Research Data Spring) CREAM project to explore the use of active metadata, or actively used metadata in research and creative processes.